Everyone loves The Bahamas—a staple in tropical travel, this island paradise rests within the Lucayan Archipelago, an exotic neighbor to the southwest of Florida and the northwest of Turks and Caicos. It’s better in The Bahamas—a slogan that brings people to return to its sandy shores time and time again. 700 islands and cays are the strokes that create the canvas of The Bahamas. Like the people that inhabit them, the islands reflect their own unique personalities—some are known for sport fishing, others for sailing, crab catching, tall mountains, bone fishing, or being home to more flamingoes than people. Nassau is the capital and the bustling commercial center of the islands, nestled on the island of New Providence where over 70% of the population of The Bahamas resides. Year round, Nassau will embrace you on your yacht charter with warm temperatures, further cementing The Bahamas as the destination for travelers worldwide. Nassau has spent years urbanizing itself, and the results are what attracts tourists to the heart of the city—its thriving downtown, full of uniquely curious boutiques, lively shopping malls, and restaurants with sweet and spicy aromas spilling out onto the streets, abuzz with tourists and locals alike. Stroll along Bay Street thoroughfare and the Woodes Rogers Walk, as the sun warms the air around you and the breeze sweeps through the city, filling your lungs with spiced stews and fried conch. Get a feel for the city with a stop by the Government House, a stately neoclassical tribute with its soft, candy color scheme, then swing by the Christ Church Anglican Cathedra where this Gothic stone is a descendent of the oldest congregation in the Bahamas from 1670. Next stop: the Pompey Museum, where the city’s scarred past filled of slavery is captured solemnly in the historic district’s oldest building, and actual site of 18th century slave auctions. The Nassau Straw Market is a treat for any tourists passing through its open-stalled venue. Hand-woven straw crafts make the perfect token of remembrance of your time in this pastel painted city. Don’t forget to take a peek at the Supreme Court of The Bahamas for the epitome of their melding architecture—delightfully salmon tones mixed with impressively grand pearl-white columns, this neo-Georgian building is home to The Bahamian Supreme Court. Life’s a beach when you choose The Bahamas. 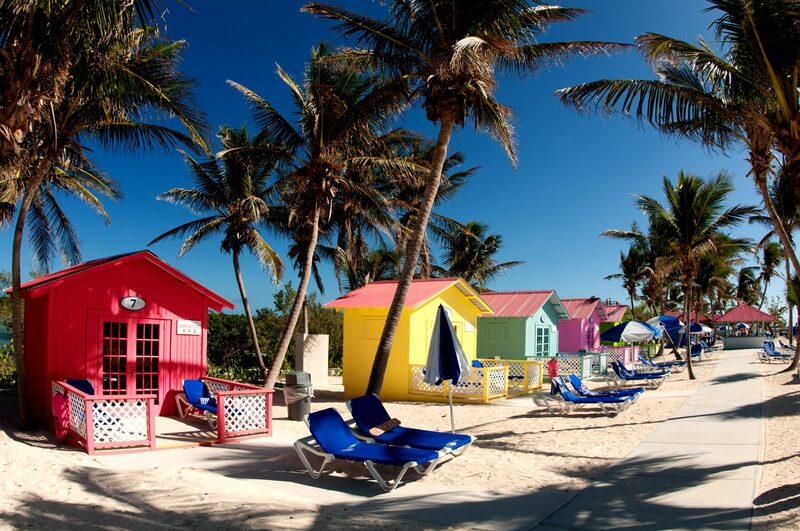 Grand Bahamas is the northernmost island and certified hotspot for pale blue waters lapping against pristinely white shores, mangrove swamps, duty-free shipping, and names like Port Lucaya, Freeport, and Xanadu to draw in people to its beaches and attractive cities. Eleuthera coaxes travelers with its beaches as pink as rock salt, like Harbour Island, and others as white as a sheet, like French Leave Beach. Long and thin, this island is where surfers flock to for the biggest of waves to the aptly named Surfer’s Beach. Southeast on the island lies Ten Bay Beach, with shallow waters and an intriguing natural cave. Ocean Hole, too, is a natural wonder—an inland spot frequented by tropical fish and sea turtles, a perfect place to swim amongst the best of Bahamian wildlife. The southern tip of the island is Lighthouse Beach, where you can make a day of it snorkeling. Then, to the north, Hatchet Bay Cave offers a bounty of stalagmites and stalactites. 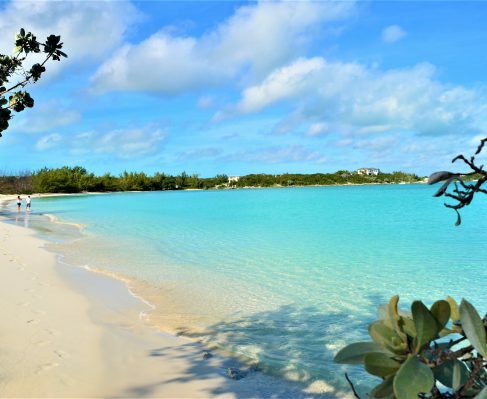 Green Turtle Cay awaits you for a relaxing day on this barrier island off of Great Abaco. Travel by ferry or your own charter yacht for a day well spent on this cay where you’ll be greeted by its small, quaint town of New Plymouth; a village that can be walked in fifteen minutes, end to end. Hop on a bicycle or golf cart and buzz to its renowned beaches, colorful boat marinas, or just enjoy the charm of the little town’s restaurants, few bars, and four grocery stores. Bahamians love their sports and games have their integral place within Bahamian culture. British influence is apparent with the ubiquity of cricket, and you can easily enjoy a game at Haynes Oval Cricket Field on Nassau and Paradise Island. Golf and holidays pair as well as rum and cola. Play a game of back nine at the Abaco Club on Winding Bay Golf Course on the Abacos or at the Sandals Emerald Bay Golf Course on the Exumas. Between swimming, snorkeling, and basking in the Bahamian sun, you won’t be going hungry. Fill your stomach on traditional foods brought to life by expert chefs and equally talented street vendors serving bites to go—cracked conch is a staple, but also look for conch salad, too, uncooked conch with citrus sauce mixed with a crisp bite of fresh vegetables like thinly sliced peppers. Rock lobster is another Bahamian favorite; eat it boiled, in patties, with a wedge of lemon, or doused in Creole sauce. Johnnycakes will taste like home, it’s similar to cornbread, created from the traditional mixture of flour, milk, sugar, and butter, but where this bread gets its real flavor is from whatever stew or curry its dunked in. Cap off your trip with something to write home about—Pig Beach, the uninhabited island in Exuma, populated only by feral pigs. Perhaps an old sailor’s tale, the pigs were said to have been dropped off on the island by sailors who wanted to later eat them, only having to never return. Others say the pigs were the only survivors of a ill-fated shipwreck. You might also find a few cats and goats in the mix, but nonetheless, the majority of the cay’s occupants are gleefully happy pigs and piglets who spend their days swimming in turquoise waters and mucking on sandy shores; not a bad life for a pig! Now you know why people always return to The Bahamas, and with its many islands, cays, coves, and caves, there’s no better way to explore all of its secrets and hidden gems than with a luxury yacht charter. Set your sails and embark today, and you’ll find yourself falling in love with not just one island—but over 700. For a quintessential Caribbean Bahamas yacht charter experience, look no further than The Bahamas. Consisting of more than 700 coral islands, The Bahamas are easily accessible from the US mainland. The naturally shallow lagoons and bays with depths of around one or two meters, make this ideal territory for those yachts with shallow drafts or catamarans.